Sega and Capcom are teaming up to bring the Ace Attorney series to life in a Japanese theme park. Theme parks are typically filled with rides and attractions full of children that won't stop yelling and adults just trying to keep them quiet. With the upcoming Ace Attorney theme park attraction, the roles might be reversed. Capcom has joined with Sega to bring Ace Attorney Investigations to Sega's Tokyo Joypolis theme park in spring 2011. The attraction will feature the series' current star Miles Edgeworth, not Phoenix Wright, as he attempts to solve a crime. 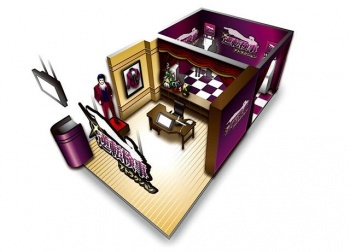 Visitors will take on the role of Edgeworth and must move around a scene to search for clues and collect evidence. A concept image of the attraction shows an office and an attached room with consoles where users will possibly have to put in their hypotheses. Entry into the Ace Attorney experience will cost Â¥600 ($7.35) and it'll last around 20 minutes. It's one place in Joypolis that I would avoid as an employee, because while yelling "Objection!" over and over is something that every visitor should do by law, it would probably become very annoying to hear day after day.